Proper handling of granular material is of critical importance in a number of industries such as pharmaceutical, oil and gas, mining, chemicals, cosmetics, and food. Processes involving such material are often poorly understood because of a lack of fundamental knowledge of material behavior. When combined with fluid flow, it leads to even more difficult challenges. Tridiagonal Solutions’ unique expertise in such solids handling class of problems combined with CFD knowhow allows us to approach such problems from a well-rounded, fundamental, yet application oriented perspective. 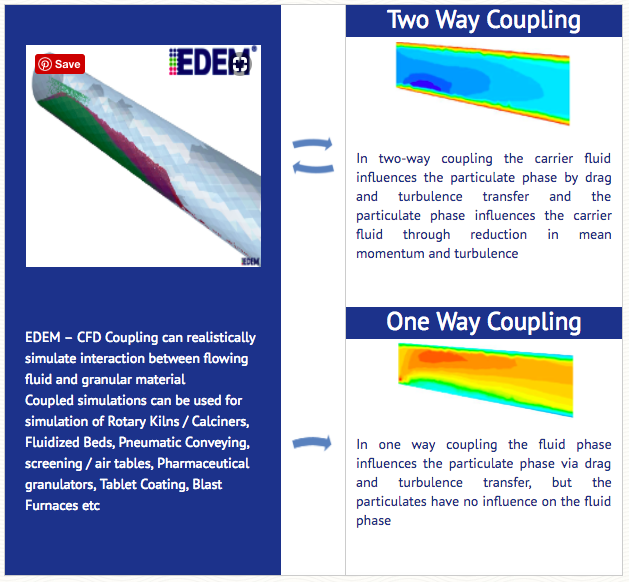 Our partnership with industry leading Discrete Element Method (DEM) software maker DEM Solutions Ltd. allows us to apply advanced particle-level simulations using EDEM™. Realistic simulation of interactions between flowing fluid & granular material provide unique insights into processes like die-filling, fluid-bed processes, heat/mass transfer in cement kilns and pellet coaters, and erosion due to sand-laden pipeline flows. DEM-CFD coupled simulations are also being used for process improvement in Pneumatic Conveying, Screening, Tablet Coating, Blast Furnaces etc. Tridiagonal engineers have also developed complex physics based models for problems like granular mixing and segregation, spray drying and impregnation, and calcination of catalyst support. We provide consulting as well as software support to some of the leading Pharmaceutical, Mining, Confectionery, Consumer goods, Oil & Gas & Cement companies. Tridiagonal offers consulting services for gaining enhanced process understanding and problem solving through DEM and coupled DEM-CFD simulations, experimental validation, prototyping services and preparing scale up/down guidelines. Spraying DEM models enhanced by Tridiagonal team to incorporate particulate wetting and inter-particulate moisture transfer. Applications that can benefit: impregnation of catalyst support, spray coating. Mixing & Segregation Granular mixing is challenging; especially when disparate particulate sizes and flow properties are involved. Understanding mixing mechanisms is critical for product quality in industries like pharmaceutical and food. Tridiagonal Engineers have expertise in developing granular flow and mixing/segregation models. Coating Tablet coating is a critical unit operation in a variety of industries – agriculture (seeds), pharmaceutical, food (chocolates and other items). Tridiagonal team uses advanced DEM models to simulate a variety of batch and continuous coating devices to help our clients better understand their processes.